“Danced the waters like a thing of life,” with streamers and banners floating in the breeze. Our correspondent tells the rest of the story. 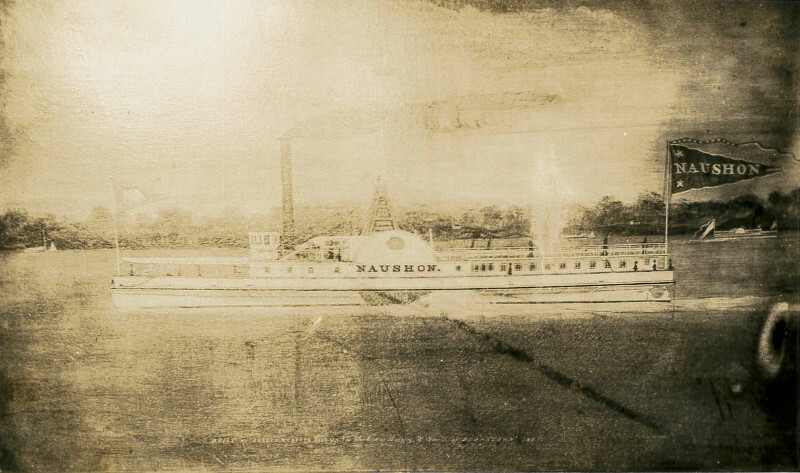 Mr. Editor: - Last Saturday, the steamer Naushon, Capt. Smith, made an excursion as above stated. We started from Edgartown at 1-2 past 6 o’clock, A.M., having on board some two hundred and fifty passengers. We soon found ourselves at the pleasant and thriving village of Holmes’ Hole, which has grown, as if by magic, the last few years. As we approached the landing, I obtained a prominent position upon the upper deck, by which I could readily perceive that the village was about to send a large delegation to witness the celebration at New Bedford. The white dresses and various colored ribbons floating in the air, indicated that our Island neighbors were not behind in neatness and richness of dress, as it is well known they are not in all the accomplishments that grace and adorn the mind. Holmes’ Hole makes a fine appearance as you approach it; the three Churches, with their towering steeples, overlooking the delightful country around, give it a city-like appearance; and the stranger would number the elegant and commodious schoolhouse among them. I think our neighbors have evinced not only good taste but good judgment in selecting so fine and commanding a situation for their school-house. A few moments after leaving here, we were at Woods Hole, where we added to our numbers, and set off for New Bedford, at which place we arrived about 1-2 past 9, A.M. Here, everything indicated life and activity. Three ships, from the Pacific, had arrived the night before, with good cargoes of oil, and their flags were streaming in the gale. 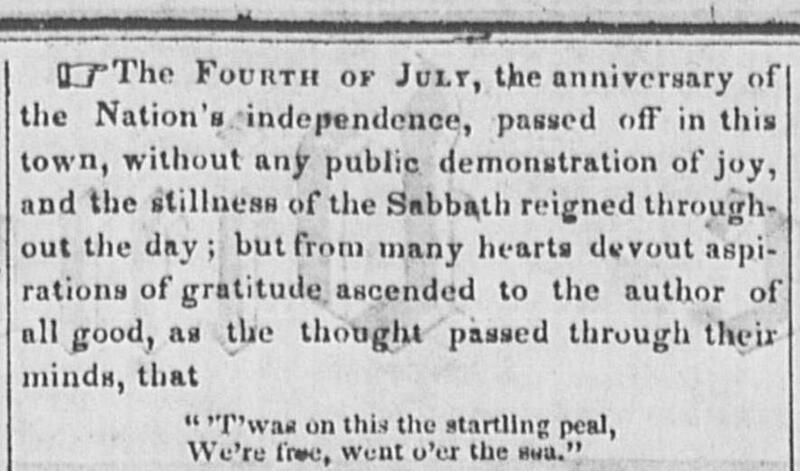 Happy were the honest tars, that they could spread their banners to the breeze, for the first time, after a long and tedious voyage, on the Nation’s Birth Day, and thrice happy that they were waving in sight of their own homes and fire-sides. Everything, as I said before, showed signs of life in this place. The celebration, I presume, has not been surpassed in our country, considering the size of the place. In the afternoon, the Naushon made an excursion to Gay-Head. Some two hundred took passage in her, to view one of the most grand and sublime natural spectacles that the eye ever looked upon, and returned to New Bedford in the evening, highly pleased with the trip. One word, sir, in regard to Captain Smith, whom we all know to be well calculated to command a steamer. He done himself great credit and won golden opinions from all under his care, throughout the day. He is mild and decisive, cool and determined, - characteristics so essential in time of danger. After remaining in New Bedford, on account of the dense fog, all night, we left for home at 5 o’clock on the 5th, highly pleased with our visit.